Back in December 2011, I asked Rep. Paul Ryan, budget guru to the House Republicans, for his favorite chart of the year (yeah, I get down like that). He sent me one from the Bipartisan Policy Center showing four lines. 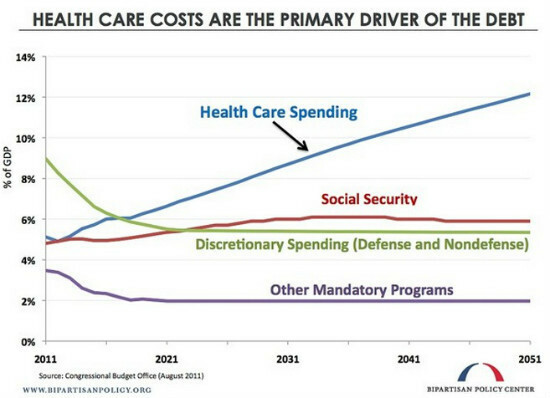 One, labeled “discretionary spending,” was drifting down. Another, “mandatory spending,” was also falling. A third, denoting Social Security expenses, was rising a bit, but not by enough to worry anyone. The fourth, health-care spending, was shooting skyward. “Government spending drives the debt, and the growth of government health-care programs drives the spending,” Ryan explained. What’s happened is that the terrain has changed and his Party has to be very, very careful about the way they talk about health care costs. We know they’re talking about Medicare, of course. That’s what “government spending driving health care costs” is all about. And Paul Ryan is the guy who set forth a plan to voucherize it that proved to be very unpopular just two years ago. So he can’t be as upfront about his agenda as he once was. But it hasn’t changed, obviously. He still wants to privatize Medicare. He just has to circle around it in ever more convoluted ways in order to keep the older base of the GOP on board. To do that he needs to pretend that he and his nice young men in the GOP are all that’s standing between them and the scary man in the White House who wants death panels to turn them into Soylent Green. I think what’s most ironic about all this is that if they would just shut up, President Obama, with his offers to raise the Medicare eligibility age and cut Social Security every few months would make their case for them. Instead they can’t stop making him into a cartoon and it makes them look like fools every time. I guess it’s just reflex.